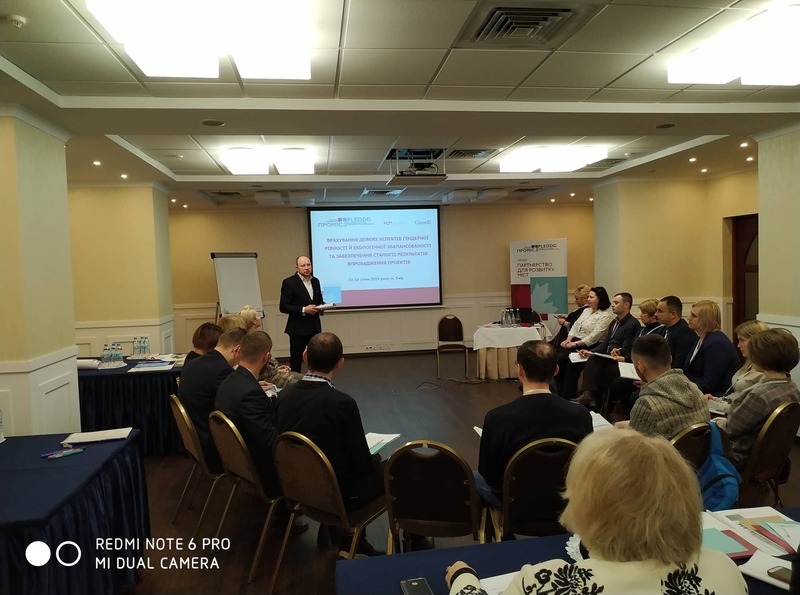 On January 22-23, 2019, in Kyiv, PLEDDG Project delivered training on “Inclusion of Gender Equality and Environmental Sustainability Aspects and Ensuring Sustainability of Project Results” for representatives of PLEDDG partner cities from Poltava and Ivano-Frankivsk regions. In the course of the training, the participants discussed effective implementation of project objectives, reporting, information support for implementation thereof, including important aspects of gender equality and environmental sustainability, analysis of outcomes achieved, assessment of achievements, and ensuring sustainability of project results. Svitlana Zhavoronkova, PLEDDG Gender Equality Consultant, explained how PLEDDG Project integrated the issues of gender equality into its activity, and how the participants should take into account those issues when drafting and implementing PLEDDG co-funded projects, as well as how to achieve stable results in terms of gender equality aspects after the completion of financial support for the implementation of projects. Yulia Skoropatska, PLEDDG Strategic Planning and Local Initiatives Coordinator, spoke about the way implementation results of PLEDDG co-funded projects should be reported. Apart from gender equality, environmental sustainability was another cornerstone topic of PLEDDG activity, as explained Hennadii Marushevskyi, PLEDDG Environmental Sustainability Consultant. He presented an analysis of the projects in relation to environmental sustainability issues. Throughout the training, discussions were moderated by Ihor Lepyoshkin, PLEDDG Senior Expert, Head of Experts Group.